Seriously? 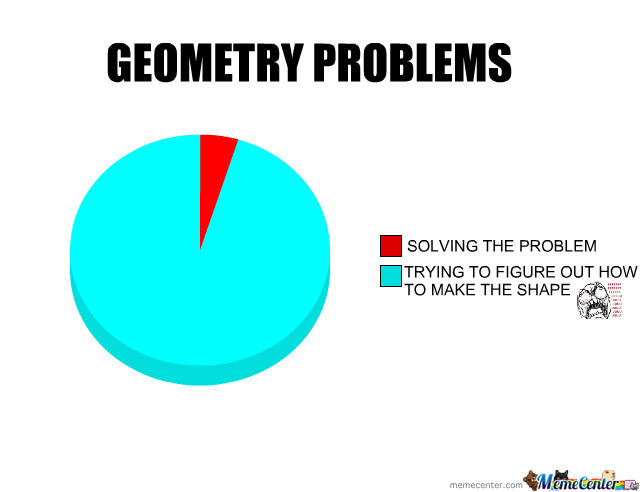 Not Geometry again… Leave That for September! Today we will be talking about how some of the most ascetic terms of geometry were once turned into a common misconception derived by one of Math’s famous scholars. Let’s start from the opposite. What is Euclidean geometry? It’s the study of plane and solid figures on the basis of axioms and theorems employed by the Greek mathematician Euclid (c.300 BCE). In its rough outline, Euclidean geometry is the plane and solid geometry commonly taught in secondary schools. Indeed, until the second half of the 19th century, when non-Euclidean geometries attracted the attention of mathematicians, geometry meant Euclidean geometry. It is the most typical expression of general mathematical thinking. Hm… seems reasonable… but what’s the plot? Given a line and a point not on it, exactly one line parallel to the given line can be drawn through the point. The postulate is not true in 3D but in 2D it seems to be a valid statement. Considering the importance of postulates however, a seemingly valid statement is not good enough. Exactly one line through the green point is parallel to the thick white line. The problem is that there are either no lines, or at least two lines “parallel to the given line through the point”. It can be shown that if there is at least two lines, there are in fact infinitely many lines “parallel to…”. 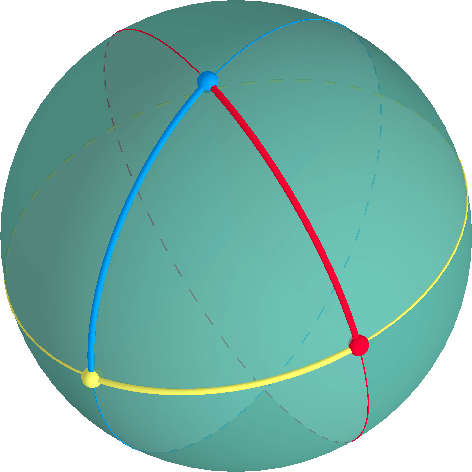 In non-Euclidean geometry, the concept corresponding to a line is a curve called a geodesic. In non-Euclidean geometry a shortest path between two points is along such a geodesic, or “non-Euclidean line”. All theorems in Euclidean geometry that use the fifth postulate, will be altered when you rephrase the parallel postulate. As an example; in Euclidean geometry the sum of the interior angles of a triangle is 180°, in non-Euclidean geometry this is not the case. If two points are directly opposite each other on the sphere (like the north pole and south pole) there are infinitely many shortest paths between the points. If the points are not antipodes, there is only one shortest path. Two great circles that are not the same, must intersect. Hence, there are no parallel lines on the surface of a sphere. An triangle is defined by three vertices and three arcs along great circles through each pair of vertices. An interior angle at a vertex of a triangle can be measured on the tangent plane through that vertex. The sum of interior angles of an elliptical triangle is always > 180°. 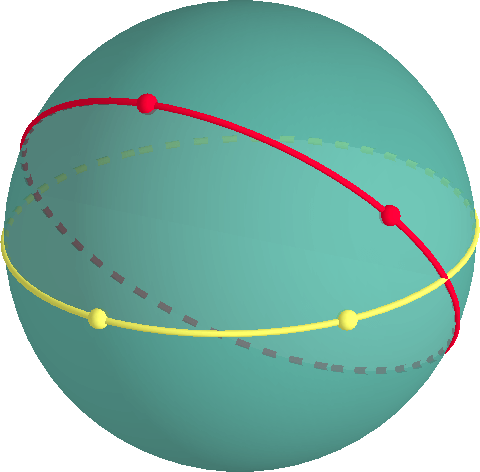 The Poincaré disc (in 2D) is an open disc, i.e. a set of points bounded by a circle not including the circle. When using the Poincaré disc model, only points in the Poincaré disc are considered. The Poincaré disc makes up the entire world. The boundary of the open disc is the circle at infinity, C∞. A geodesic through points A and B is defined as the circular arc through A and B that is perpendicular to C∞. If A and B lie on a diameter of C∞C∞, that diameter is the geodesic through A and B.
Geodesics defined by two points each. through the white point not intersecting the white geodesic. An interior angle of a triangle is measured between the corresponding tangent lines. The sum of interior angles is always < 180°. If the vertices of a triangle move towards circle C∞, the angle sum tend to 0. Points that lie at C∞ are called ideal points. The limiting triangle as the vertices tend to infinity (C∞) is called an ideal triangle. An ideal triangle has angle sum 0. Since the vertices of an ideal triangle lie at infinity, the perimeter of an ideal triangle is infinite. Furthermore, it can be shown that the area of an ideal triangle is π. Hence, all the triangles in the topmost animation have the same hyperbolic area. All we can say is that the fifth postulate primarily states the extensions explicitly for 2d figures, yet not 3d. Therefore it had brought a lot of issues at its own time of calculations.